Contains Raw Cacao and a dash of Organic Maple Syrup. It has a very pleasant taste and is not too sweet. This fresh cow's milk is NOT pasteurized or homogenized, and from healthy free-roaming, 100% pastured Jersey and Guernsey cows (mixture of A1 and A2 herd). It can only be obtained by members of this private club and is NOT for sale to the general public. Unlike organic milk in health food stores, these 100% grass-fed cows produce milk rich in vitamin A, Vitamin D, Vitamin K2, and CLA. In addition, this milk contains enzymes and beneficial bacteria, both of which help digestion and overall immune health. The farmer has a mixture of A1 and A2 milk. When the farmers milk the cows they use stainless steel buckets and a plastic, state inspected hose which filters the milk from contaminants. They clean and sterilize the hose every day after milking. STORAGE TIPS: for optimal shelf life of 2 weeks, purchase the milk in GLASS not plastic, and purchase in smaller 1/2 Gallon size so that it minimizes exposure to air. Keep your milk in BACK of fridge where it will stay coldest and turn the fridge temp to 36 degrees (a little colder than normal) and this will help keep the milk fresh longer before it turns into buttermilk. Warning: the Gallon glass jar of milk comes with no handle and is difficult to pour from unless you are making a large batch of cheese and pouring it all out in one shot. We recommend the half gallon size in Glass which has a handle and is easy to pour from. Plastic containers all come with easy to hold handle, but shelf life is shorter -about 10-12 days. Freezing your milk for longer storage? Since the cream rises to the top, be sure to first shake it up really well to mix the cream back into the milk. Then, pour out about 1-2 inches of milk to make room for expansion during freezing. Do not freeze in glass since it shatters. You may transfer to pyrex glass for freezing, or purchase in plastic. After thawing, put milk in blender to remove any lumps and get back original consistency. 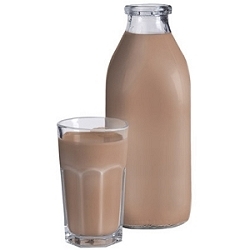 This chocolate milk is by far the best I ever tasted. My husband and kids love it. Will continue to order!!! !